Plantar fasciitis is caused by the inflammation of the plantar fascia, a supporting tissue that connects the heel bone to the toe and runs across the bottom of the feet. This condition results from the injury or overuse of the foot, leading to the stretching and wearing out of the fascia. Typical symptoms of plantar fasciitis include stabbing pain and stiffness towards the heel, especially experienced in the morni ng or after long periods of sitting or standing. Plantar fasciitis is common in runners, overweight individuals, and people wearing inadequately supporting footwear. This common orthopedic foot complaint tends to be more prevalent in active men in the age range of 40 – 70 years. 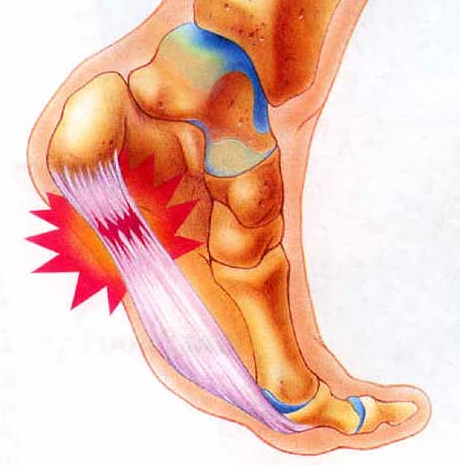 Plantar fasciitis is diagnosed by physical examination of the foot to locate the tender areas. Imaging tests, such as X-ray and magnetic resonance imaging, may be done to rule out other underlying factors. Plantar fasciitis can be treated with conservative measures, such as oral pain medications (ibuprofen and naproxen), physical therapy to strengthen the muscles and improve flexibility, night splints to stretch the calf and foot arch, and orthotics(heel cups, cushions, arch supports) for the even distribution of foot pressure. Patients, who do not respond well to conservative approaches, may require steroid injections to control pain and inflammation. 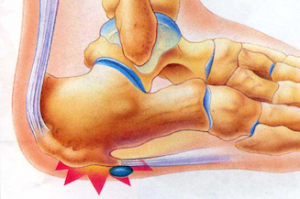 However, the chance of further weakening the plantar fascia is there with such procedures. Another approach is extracorporeal shock wave therapy, which deliverssound waves to the area, to facilitate healing. For severe pain, surgery may be necessary to detach the plantar fascia from the heel bone. Platelet-rich plasma (PRP) therapy has shown promising results in healing chronic plantar fasciitis. PRP works by releasing various healing factors as well as recruiting stem cells to the site of damage to promote tissue regeneration. PRP is obtained from the patient’s blood sample, after concentrating out the platelets. Platelets are known to aggregate at sites of injury, and lead to hemostasis, the formation of new connective tissue and revascularization. Various animal and human studies have revealed the efficacy and safety of PRP therapy in repairing chronic non-healing tendon injuries, such as plantar fasciitis. Ragab et al studied the effect of PRP therapy on 25 patients with chronic plantar fasciitis, and demonstrated decreasing pain for a 10.3 month follow-up period. Barrett et al treated 9 patients with PRP to show improvement in conditions as noted by ultrasound and pain scale. Aksahin et al compared PRP therapy with steroid injections for plantar fasciitis in 30 patients to show similar improvements in symptoms; the authors concluded that PRP therapy was safer in the patients. Another promising approach for chronic plantar fasciitis is the use of stem cell therapy. Stem cells are primitive cells that can undergo differentiation to form different types of cells in the body, such as bone, blood, cartilage, tendon, ligaments, etc. These cells are responsible for healing tissue damages by generating new healthy cells. However, with age, the body loses its ability to attract enough stem cells to the site of injury. In this regard, stem cell therapy delivers a high concentration of stem cells to the affected area to promote natural healing. Ragab EM, Othman AM. Platelets rich plasma for treatment of chronic plantar fasciitis. Arch Orthop Trauma Surg 2012; 132(8):1065-70. Barrett S, Erredge S. Growth factors for chronic plantar fasciitis. Podiatry Today 2004; 17(11):37-42. Aksahin E, Dogruyol D, Yuksel HY, Hapa O, Dogan O, Celedi L, Bicimoglu A. The comparison of the effect of corticosteroids and platelet-rich plasma (PRP) for the treatment of plantar fasciitis. Arch Orthop Trauma Surg 2012; 132(6):781-5. UNLIKE STEROID INJECTIONS AND SURGICAL INTERVENTIONS, WHICH ARE ASSOCIATED WITH TREATMENT SIDE EFFECTS AND FURTHER WEAKENING OF TISSUE STRUCTURES, STEM CELL THERAPY AND PRP THERAPY ARE WELL-TOLERATED IN PATIENTS. CONTACT US AT R3 STEM CELL CLINICS FOR AN EVALUATION OF YOUR CONDITION, AND TO LEARN MORE ABOUT THIS CUTTING-EDGE TECHNOLOGY. CALL (844) GET-STEM TO FIND AN R3 CENTER NEAR YOU TODAY!